Nelson Mandela, South Africa’s first black president and an icon of the struggle for freedom, died at age 95 on December 5, 2013. Mandela was known affectionately by his clan name Madiba, and considered Tata, father of the nation, by many South Africans. He led the struggle against Apartheid and was imprisoned for 27 years. After his release in 1990, his insistence on reconciliation and forgiveness instead of vengeance saved the country from civil war and lead to the formation of an inclusive democracy. 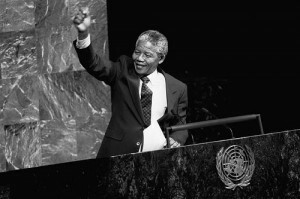 He served as president of South Africa for one term from 1994 to 1999, and was awarded the Nobel Peace Prize in 1993. Mandela last appeared in public at the end of the 2010 soccer World Cup. He suffered from a recurring lung infection and was in hospital from June till September 2013. He is now resting. He is now at peace. Our nation has lost its greatest son, our people have lost a father. Although we knew that this day would come, nothing can diminish our sense of a profound and enduring loss. His tireless struggle for freedom earned him the respect of the world. His humility, his compassion, and his humanity earned him their love. This can be interpreted as a call for peace and unity, as Mandela’s death comes at a time of introspection and struggles in South Africa, not the least of them over political leadership within the ruling party ANC. The rift between government and the people became most evident during and after the Marikana massacre in August 2012. The continuing protests of Cape Town residents against poor sanitation systems are one evidence of what NY Times’ Lydia Polgreen calls “perhaps [the country's] most serious unrest since the end of apartheid”. Madiba will not first and foremost be remembered as the great statesman he was, but rather as an inspiring human being, whose kindness in combination with his irrevocable belief in freedom and forgiveness inspired generations. And so it is with uncommon sadness that the world wishes this politician “Hamba Kahle” – Farewell. Image by Flickr user United Nation Photo, used under a Creative Commons license. Read more: The Mail&Guardian published its “Nelson Mandela. Tribute to an Icon” landing page as a ressource of multimedia news, reports and blogs, earlier this year, when Mandela was in critical condition.